If you are a fan of the new Disney Movie Frozen, you’ll understand what I mean when I say that it feels like Elsa truly has set off an eternal winter here in the real world! Thankfully, spring is on the horizon (45 days away), and warmer days are ahead. Hopefully you have a fun trip planned to a warm destination soon, but if not, I have partnered with some great folks to offer one winner an amazing prize, that also happens to tie in well with the upcoming Valentine’s Day holiday. One lucky winner will win a $1,500 Carnival Cruise Gift Card to use toward a cruise of their choice! There is no expiration date on the gift card, so you can use it whenever you want to plan your vacation. 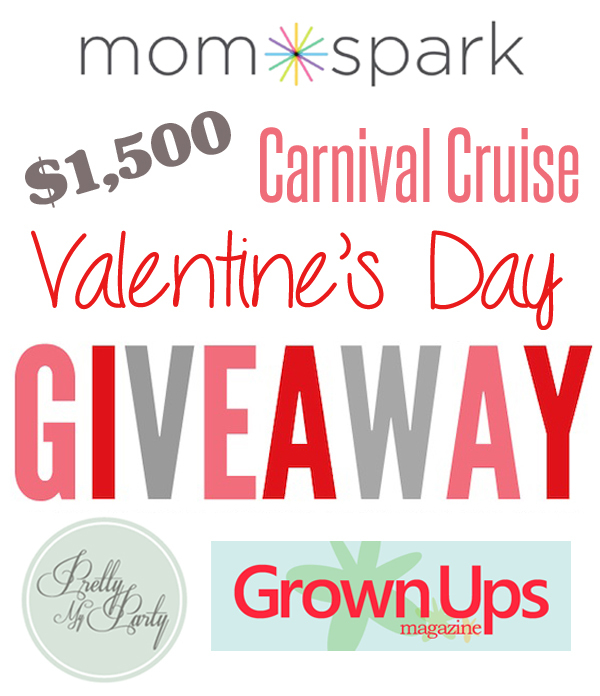 This amazing giveaway is sponsored by Pretty My Party, Mom Spark and Grown Ups Magazine, along with a group of fabulous bloggers and businesses and me! 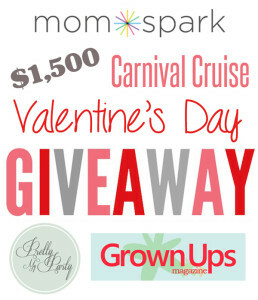 This giveaway is blog/business sponsored and wouldn’t be possible without the following: Danya Carey Photography, Madame Deals, Town and Country Living, The Everyday Home, An Alli Event, Party With The Warriors, The Pretty Party Shoppe, Crafts a la Mode, Memories By The Mile, Inspiration for Moms, Tips From A Typical Mom, We Heart Parties, We Heart Mom, Stretching A Buck, Vintage Confections, Cool Coatz Hydrographics, Consolidated Label, Debt Free Spending, Party Patisserie, Rose Knows Coupons. The full list of giveaway sponsors can be viewed on the Rafflecopter entry form below. Prize: 1 winner will receive a $1,500 Carnival Cruise Gift Card to use toward a cruise vacation on Carnival Cruise Lines. Eligibility and Rules: NO PURCHASE NECESSARY TO ENTER OR WIN. A PURCHASE DOES NOT IMPROVE YOUR CHANCES OF WINNING. VOID WHERE PROHIBITED BY LAW. This giveaway is open to individuals 18 and older who reside in the United States. The winner will be chosen randomly through the Rafflecopter form. It is the sole responsibility of the winner to adhere to all laws, which includes payments to any governing tax body. Winner Selection: The winner of the giveaway will be selected in a random drawing through Rafflecopter from among all eligible entries received throughout the promotion period. The random drawing will be conducted within 48 hours of the closing of the giveaway by Pretty My Party or its designated representatives, whose decisions are final. Odds of winning will vary depending on the number of eligible entries received. Winner will be notified by email by hello@prettymyparty.com. Potential winner must accept the prizes by email as directed by Pretty My Party within 48 hours of notification. Any winner notification not responded to or returned as undeliverable may result in prize forfeiture. The potential prize winner may be required to sign and return an affidavit of eligibility and release of liability, and a Publicity Release (collectively “the Prize Claim Documents”). Disclaimer: This giveaway is blog sponsored and is in no way associated with Carnival Cruise Lines. If there are any questions, please email hello@prettymyparty.com. The more entries you complete on the Rafflecopter form, the higher your chances are of winning. If you don’t have time to fill out all of the entries you may come back and complete any entries that you may have missed. Good Luck and Happy Valentine’s Day!